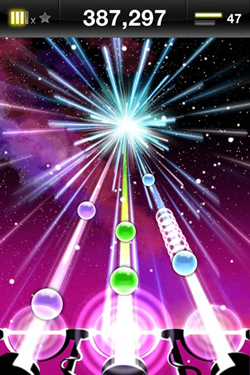 The sequel to Tap Tap Revenge, the iPhone’s most popular game ever, is hitting the App Store tonight. The original version(iTunes link) of the game has been downloaded over six million times and spawned a number of spinoffs featuring licensed music from Weezer and Nine Inch Nails. You can learn more about the sequel here, and we’ll update the post as soon as it goes live on the App Store. Update: You can download the app here. Created by iPhone development house Tapulous, the TTR series is akin to a ‘Guitar Hero’ for the iPhone, asking users to tap their fingers on a flurry of scrolling blobs that are presented in time with the music (it’s fairly easy to get started, and very addictive). Tap Tap Revenge 2 will include a new game engine with a revamped look and feel, along with some gameplay additions that include new moves like the “Tap & Hold” and “Multi-Tap”. The game will feature over 150 free songs (downloaded after installing the app) including music from Death Cab for Cutie, an exclusive song by The Cyrstal Method, and another by Stroke 9. The game is expanding its social options, tapping into the iPhone’s network effect to create a ‘Challenge’ system that lets users face off with friends, who attempt to beat each others scores. The game will also include an ‘achievements’ system, and a complimentary new feed for alerts, allowing users to keep track of their friends’ accomplishments. There’s also a “Kids Mode” that offers a more basic version of the game for younger children. TTR2 is sure to be another hit for Tapulous, but the game is still hindered by the App Store’s ban on allowing developers to include in-game transactions. Whenever Tapulous wants to release a premium song on the TTR platform, it has to do so through an entirely new game – it can’t sell premium songs through an integrated store in Tap Tap Revenge. If Apple ever does remove the restriction (and it should), Tap Tap Revenge and its sequel could well become some of the store’s most lucrative titles.